Some More finds from my lost 12 Inch 78's this one's from 1932 and a UK pressing to boot. 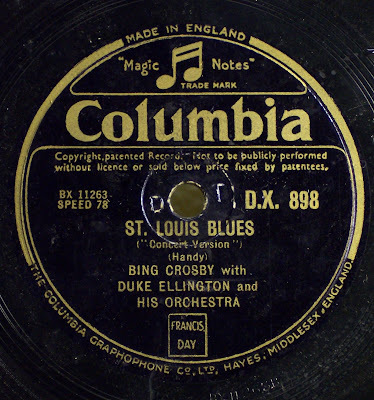 St Louis Blues is odd as it features Bing Crosby on vocals! 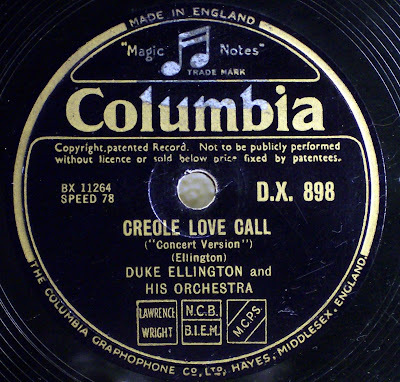 Duke Ellington - Creole Love Call MP3 "Good"
Duke Ellington - Creole Love Call MP3 "Too Much Noise Reduction"
Duke Ellington - Creole Love Call MP3 "Fake Stereo"
Duke Ellington - St Louis Blues MP3 "Good"
Duke Ellington - St Louis Blues MP3 "Too Much Noise Reduction"
Duke Ellington - St Louis Blues MP3 "Fake Stereo"
A belated thanks for your ongoing tremendous efforts with these oldies. The quality of your rips, restoration and the music speaks for itself. You are to be commended on you labour of love! Greetings from Japan. . .
Could you drop me an e-mail, please? See under my profle and be sure to type out the correct e-mail address - it is slightly altered in order to avoid spam. . .